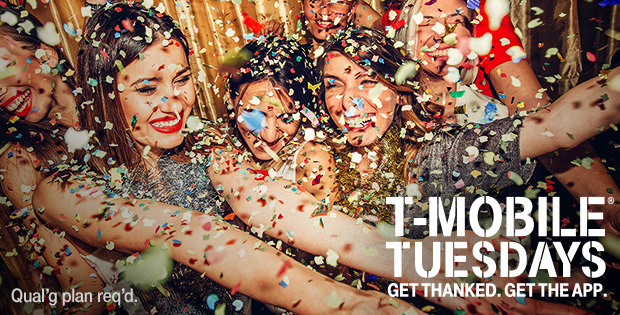 The details of the final T-Mobile Tuesdays in July have been revealed. On July 31st, T-Mobile customers can get a free movie rental from Vudu and a free delivery with $35 purchase from Instacart, a service that delivers groceries from local stores. Also available will be a $50 credit for Rover, a dog walking and dog sitting service, and an offer from HotelStorm. Rounding out next week’s gifts is $5 off any movie ticket and no fees from Atom Tickets. This offer can only be claimed once in July, so if you’ve gotten it before, you can’t claim it again. Next Tuesday is the final day in July, though, so you’ll want to get this gift if you haven’t already done so. There is no sweepstakes happening next week. Is the Vudu rental actually free? Those discounted rentals the past few times aren’t cutting it. I love the credits work for disc to digital too, but I HATE it’s only one credit per Vudu account. Yes, there’s ways around it but it’s not worth the hassle. There was a way around that but not anymore. We got around that by setting up multiple VUDU accounts and sharing a single Ultraviolet account through VUDU. All the purchases on the accounts are linked to Ultraviolet and our full Ultraviolet library is accessable from our shared VUDU accounts. Unfortunately VUDU, in their ultimate wisdom, discontinued Ultraviolet library sharing to new users earlier this year but they did grandfather in everyone who was already using it. Unfortunately, even though we get to continue sharing, we can’t add new accounts to our share. I hope that they won’t be cutting disc to digital next which, like library sharing, is also done through Ultraviolet. Had no idea they grandfathered in users. I had two accounts but for some reason on my second Vudu I got a message saying it was not linked to a UV account. Called them and they said to bad. I just don’t get why T-Mobile One customers only get one credit per account but up until April or whenever it was the Simple Choice (I think, might have been another plan) got credits once a month per line and they did stack. Oh well, beggars can’t be choosers. They’ve been providing credits, not free or discounted rentals (besides a couple of ‘choose a free rental from a list of crappy selections’ they’ve done over the years). Last month’s credits were $3.50, enough for a free standard priced SD rental, a discounted HDX rental, or a free disc to digital conversion from DVD to SD or Blu-Ray to HDX. The standard credit VUDU’s been giving out is $5.50, hopefully they’re going back to that. Personally we haven’t been wasting the credits on rentals but instead doing disc to digital and the $4.99 weekend sales. Between T-Mobile Tuesdays and the now discontinued monthly Binge On credits, our collection has ballooned to over 500 movies. I wish I had thought to use the $3.50 for disc to digital, but I completely forgot about that. I just let the credits expire, since there wasn’t anything I wanted to rent at that price. Is there an easy way to compare your disc library to Vudu’s digital library? Sorry what is disc to digital? Give me those sweet, sweet VUDU credits!